This refers to the press conference of Hurriyat (G) Chairman Syed Ali Shah Geelani in which he termed that stone pelting and other form of violence is not the part of our movement. Burning railway stations, schools and other public property can’t be justified. His whole talk in press conference is genuine and no body can deny it. But he seems to suffer from selective amnesia; recently he called stone pelting as weapon of oppressed and weapon of resistance when few persons came against stone pelting. If stone pelting is not part of movement then out of 45 killed more than 40 were killed during stone pelting then who they were? 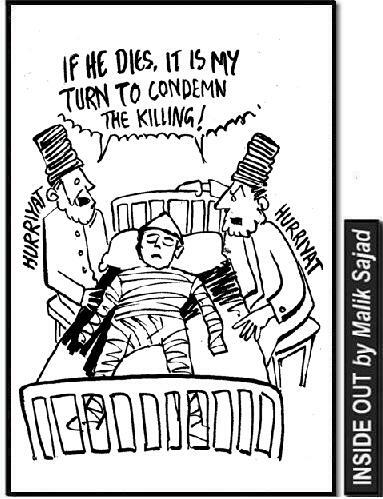 Why his Hurriyat was glorifying and paying tributes to these youth if they were out of movement. Now were are his aides who were issuing statements calling youth to launch Intifada. Why it is only after 55 days he issues instructions of calm, why not at first place that would have saved many precious lives. Why it is only after situation turns drastic and in shape of rebellion he plays pacifist. People are not fools that they won’t understand in between the lines. Clearly he seems to get overtaken by Indian advisers who met him in detention. From almost two months Kashmir has witnessed spate of killings by men in uniform (CRPF and Police). Surging emotions youth come on streets with trigger happy forces turning protests into funeral processions that too dealt with brute force. More than 45 people were killed and hundreds of injured with many battling for life in hospitals. Life has come to grinding halt with curfews both declared and undeclared, restrictions and strikes. When ever situation turns to have some semblance of ‘normalcy’ troops make it sure to fill the coffins with indiscriminate and unprovoked firing. Latest being in Amargargh Sopore, Pattan and Chanapora, Khrew, Pampore, Srinagar the situation there wasn’t so tense that need to be restrained with bullets only. It is not the simple case of troops killing youth to be followed by protests only; there is more than meets the eye. It seems to be the extension of sinister games played by Delhi in Afghanistan. Delhi wants to keep the Kashmir on boil till its settles it score in Afghanistan, the current strategy of America to have Pakistan friendly regime in Afghanistan no way suits India’s designs as she has made deep inroads in many spheres of life there and won’t easily digest packing of bags there. But Delhi is making sure that the situation in Kashmir doesn’t take the shape of lakhs coming on streets, it wants only unrest should prevail where people should turn desperate to return to their routine work. 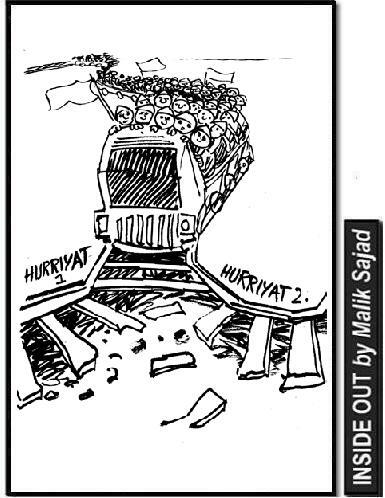 In this process if not all but some sections of Hurriyat calling protest programmes without any sound strategy and immediate cause and demand are intentionally or unintentionally playing in the Indian hands. Even the statement of Syed Salahuddin (U.J.C Chief) calling pro-freedom leadership to give direction to the people’s anger was taken with contempt, here every one reserves his/her right to ask him why it took him 40 days to come with such a statement when Kashmir had plunged into deep chaos. Indian time buying tactics to keep Kashmir issue lingering is not new but by provoking unrest in Kashmir if they believe they will gain something in long run they are totally mistaken, this time they are dealing with die-hard youth who have great courage, determination and are steadfast in their resolve than present traditional leaders. A new revolution is in horizon which will threw new and young leadership which will have vision and steely resolve to carry on the sacred cause forward towards its logical conclusion. This refers to the Inside Out of July 3rd and 5th by Malik Sajad on G.K where in he has brilliantly portrayed the confusion and chaos in which pro-freedom leadership finds itself. Despite having the same constitution, same goal, same agenda and same cause of right of self determination for the oppressed people of Jammu and Kashmir they feel comfortable in getting themselves introduced separately. This division and disseverance has only compounded the destiny and the sacred goal of millions of Kashmiris striving to achieve their birth right. Even at this crucial juncture they feel no need in steering the ship out of troubled waters jointly and continue to bask under the (mis) glory of suffixes attached to the same name which they claim to represent. Their programs at this point of time clearly reflect the lack of proper ground work with people left without any direction and guidance and at the mercy of their own, they are digging their own grave due to their flawed strategy. People’s movement can’t be sustained only through issuing statements only; it needs lot of understanding and a huge task to involve every section of society. It doesn’t mean reaction only it needs imagination as well. Besides sacred and big concept of freedom issues of peoples concern need to be taken for its survival, people’s involvement and success. 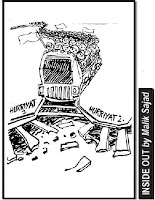 It is high time for Pro-freedom leadership to shun their ego and formulate joint strategy to save the future of Kashmir from getting annihilated if they are really serious to pull Kashmir back from chaos, quandary and quagmire unless time will turn them irrelevant if they refuse to shun their differences for larger interests of people of Kashmir.